Will the NFL ban on kneeling during the National Anthem help improve ratings? Now that the NFL has ruled that players can't kneel, the protests can no longer be used as an excuse for poor ratings. On Wednesday, the NFL adopted a policy that requires players to either stand during the anthem or wait in the locker room. 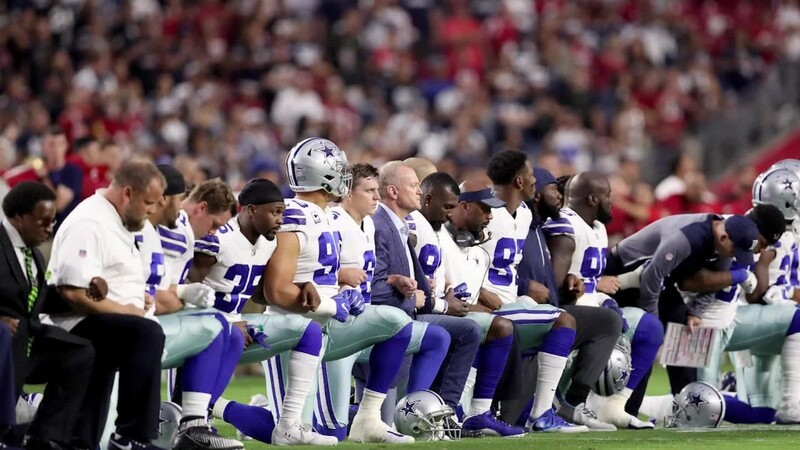 The new guidelines also say that teams will be fined if players are on the field and "do not stand and show respect for the flag and the Anthem." Giants owner John Mara said "there's no question [the protest] had an impact on the business." Houston Texas owner Bob McNair said it was important to pay attention to fans' concerns because without them "you're dead." Jacksonville Jaguars owner Shahid Khan said fans are there to watch football and it was important not to have "distractions." While the NFL never directly blamed the protest for lagging ratings, Commissioner Roger Goodell made it clear that the league needed to "move past this controversy." Wednesday's rule change suggests that the league was feeling the pressure of the protests. NBCUniversal chairman Linda Yaccarino said she felt ratings had been affected by the protests -- but said there was likely no way to prove it. CBS Sports Chairman Sean McManus echoed that sentiment. He said that the protests are "something [fans] don't find attractive or they don't find compelling in coverage of the football game." According to the poll, others stopped watching games because they felt the league wasn't addressing players' social concerns, and some viewers were turned off by the way domestic violence cases were handled by the league. Other fans cited concerns about concussions. Media executives also cited other problems with the NFL. 21st Century Fox CEO James Murdoch said in October that he thought ratings were down because there was an "overproliferation" of football. NBC Sports chairman Mark Lazarus said he also thought there was "fatigue" on the part of fans with so many football games being broadcast. "Nothing beats the NFL when it comes to television that captures people's attention" said 21st Century Fox President Peter Rice, after signing a new 5-year deal for "Thursday Night Football." Though it's yet to be seen what will happen with this season's ratings, the NFL is trying to address some other lingering issues. It will make sure that the best match-ups are slated for primetime during the 2018-2019 season. The NFL has also focused on speeding up the pace of play and has worked with broadcasters to change how ads are run during games. It's also partnered with social media companies to stream games differently and reach younger viewers.